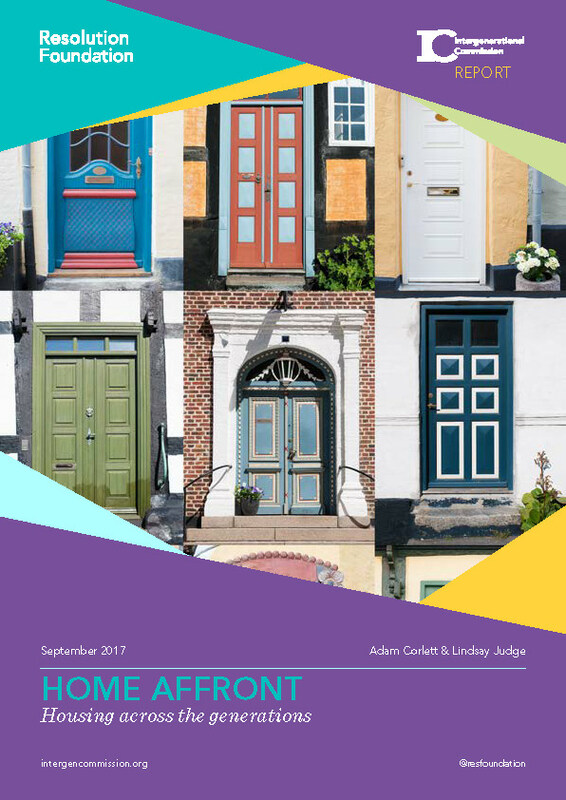 In this, our 9th report for the Intergenerational Commission, we take on the hugely important topic of housing. We compare the housing outcomes achieved by different generations over the life course and assess the extent to which intergenerational inequalities exist when it comes to security, to affordability and to quality. We explore how the housing experience of each generation has been determined by demographics, policy and the market alike, and what we might expect the future to hold. After those born in 1946-50, every cohort has experienced lower home ownership rates than its predecessor at the same age. Today’s families headed by 30 year olds are only half as likely to own their home as the baby boomer generation was at the same age, and home ownership has declined across all regions and income groups. With falling home ownership and a shrinking social rented sector, four out of every ten 30 year olds now live in private rented accommodation – in contrast to one in ten 50 years ago. Millennials have also been more likely to be living with their parents in their mid-20s than previous cohorts, while families are much less likely to house their elderly parents than they were in the past. The quality of housing has in many respects improved hugely. But millennial-headed households are more likely than previous generations to live in overcrowded conditions, and when we look at the distribution of square meterage we see today’s under-45s have been net losers in the space stakes compared to previous cohorts, while over-45s are net gainers. More recent generations have also had longer commutes on average than previous cohorts, despite spending more on housing. We conclude by modelling what the future might hold for today’s young people. Based on historic relationships between a range of factors and home ownership growth, an optimistic set of assumptions would imply that these cohorts could make up much of the lost ground on home ownership. However, if similar trends to the 2002-2012 were to return, less than half of millennials will buy a home before the age of 45 compared to over 70 per cent of baby boomers who had done so by that age. Clearly there is scope for political determination to make a difference to the housing outlook, and future work for the Intergenerational Commission will consider what action should be taken.